It's time to make room on your shelf: the fourth and final volume of Shigeru Mizuki's massive manga history of the Showa era has arrived! Covering the era's final years, 1953 through 1989. This volume concludes the 2500 page history. 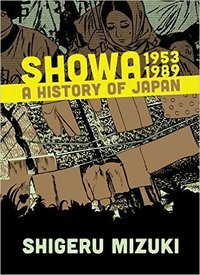 As an added bonus, this volume has a stunning 64 page full color epilogue that wraps up Mizuki's feelings about having lived through the Showa era as well as his hopes at the dawn of the Heisei era.